One of Turkey’s most important macroeconomic problems is persistent current account deficit. Credit volume has been shown as one of the basic determinants of current account rate, especially after the global financial crisis in Turkish economy. The Central Bank of Turkey has begun to implement the policy to ensure financial stability by slowing down credit volume in response to current account deficit affected by rapid credit expansion after the global financial crisis of 2008. In this study, we investigated the relationship between credit volume and current account deficit covering the period of 2005:Q1- 2015:Q3 employing Bound test approach, ARDL model and Kalman filter method. Bound test results suggest the existence of co-integration relationship between current account deficit and credit volume. ARDL model results indicate that the credit volume is statistical significant and positively affects current account deficit in the short and long run. The results show that a 1 % increase in credit volume leads to nearly a 0.62 % increase in current account deficit. Kalman Filter method results indicate that the effect of credit volume on current account deficit increased after global financial crisis and started to decrease after 2013. Akbas, Y. E., Senturk, M., and Sancar, C. (2013). Testing for causality between the foreign direct investment, current account deficit, GDP and total credit: Evidence from G7. Panoeconomicus, 60(6), 791-812. DOI: 10.2298/pan1306791a. Aliogullari, Z. H., Baskaya, Y. S., Bulut, Y. E. and Kilinc, M. (2015). Turkiye'de Tuketici ve Ticari Kredilerin Cari Acikla Iliskisi. TCMB Ekonomi Notlari, 2015-19. Atis, A. G. and Saygili, F. (2014). Turkiye’de Kredi Hacmi ve Cari Acik Iliskisi Uzerine Bir Inceleme. Business and Economics Research Journal, 5(4), 129-141. Aizenman, J. and Jinjarak, Y. (2014). Real estate valuation, current account and credit growth patterns, before and after the 2008–9 crisis. Journal of International Money and Finance, 48, 249-270. DOI: 10.1016/j.jimonfin.2014.05.016. Bitzis, G., Paleologos, J. M. and Papazoglou, C. (2008). The determinants of the greek current account deficit: the EMU experience. Journal of International and Global Economic Studies, 1(1), 105-122. CBRT. (2016). Interactive Charts. http://www.tcmb.gov.tr/wps/wcm/connect/TCMB+TR/TCMB+TR/Main+Menu/Para+Politikasi/Interaktif+Grafikler/Cari+islemler+dengesi. accessed on 12.05.2016. CBRT. (2016). Electronic Data Delivery System (EDDS). evds.tcmb.gov.tr/index_en.html. accessed on 12.05.2016. CBRT. (2010). Financial Stability Report. 11, 1-70. CBRT: Ankara. CBRT. (2011). Inflation Report-I, 1-138. CBRT: Ankara. Ertugrul, H. M. and Kenar, A. (2013). External Debt and GDP Relationship: A Dynamic Analysis for Turkey. Trakya Universitesi Iktisadi ve Idari Bilimler Fakultesi E-Dergi, 2(1), 78-94. Ganioglu, A. (2013). Rapid Credit Growth And Current Account Deficit as The Leading Determinants of Financial Crises. Leibniz Information Centre for Economics, Economics Discussion Papers, No. 2013-35. Gocer, I., Mercan, M. and Pek, O. (2013). Kredi Hacmi Artisinin Cari Aciga Etkisi: Coklu Yapisal Kirilmali Esbutunlesme Analizi, Istanbul Universitesi, Ekonometri ve Istatistik Dergisi, 18(1). Karagol, E., Erbaykal, E. and Ertugrul, H. M. (2007). Turkiye'de Ekonomik Buyume ile Elektrik Tuketimi Iliskisi: Sinir Testi Yaklasimi. Dogus Universitesi Dergisi, 8(1). Kilic, C. (2015). Tuketici Kredileri ve Cari Acık Arasindaki Iliski: Turkiye Ornegi. Ataturk Universitesi Iktisadi ve Idari Bilimler Dergisi, 29(2), 407-420. Mangir, F. and Ertugrul, H. M. (2012). Sermaye hareketliligi, tasarruf ve yatirim iliskisi: Turkiye ornegi. Iktisat Isletme ve Finans, 27(317), 61-87. DOI: 10.3848/iif.2012.317.3362. Narayan, P. K. ve Narayan, S. (2005). 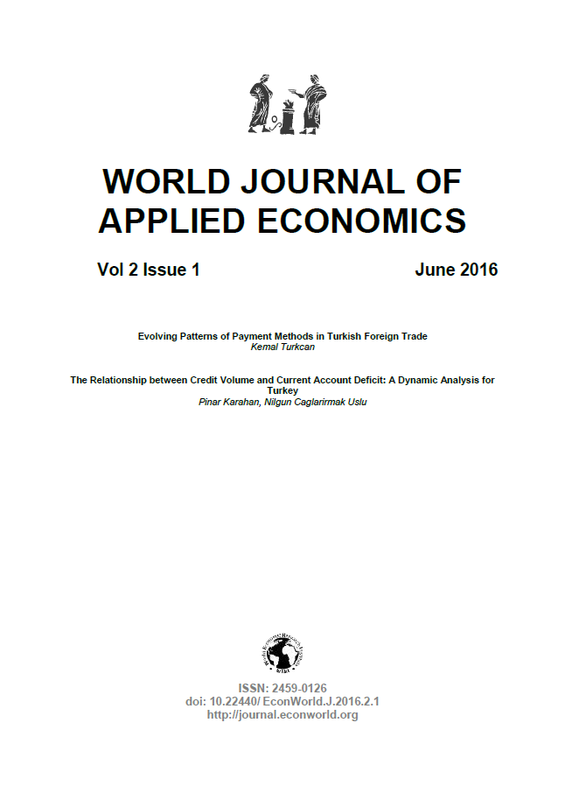 Estimating Income and Price Elasticities of Imports for Fiji in a	Cointegration Framework. Economic Modeling, 22, 423-438. DOI: 10.1016/j.econmod.2004.06.004. Sandalcilar, A. R. and Altiner, A. (2014). Turkiye'de Tuketici Kredileri ile Cari Islemler Acigi Arasindaki Nedensellik Iliskisi. Bankacilar Dergisi, (89), 28-40. Telatar, E. (2011). Turkiye'de Cari Acik Belirleyicileri ve Cari Acik-Krediler Iliskisi. Bankacilar Dergisi, 78, 22-34. Togan, S. and Berument, H. (2011). Cari islemler dengesi, sermaye hareketleri ve krediler. Bankacilar Dergisi, 78, 3-21.